mBus 10 converter is a transparent converter from RS232 to MBus interface. On MBus side it works as MBus master and enable to connect maximum 10 standard MBus receivers (slaves). It can be used with all devices equipped with MBus interface like: heating energy meters, electric energy meters, data recorders and many others with MBus interface. 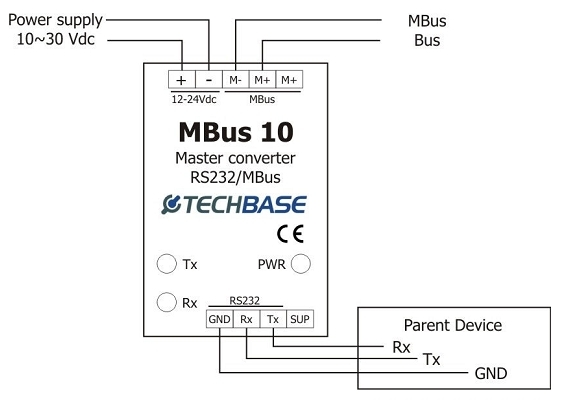 mBus 10 can successfully replace PW3 Relay M-Bus level converter or any other M-Bus master converter. mBus 10 converter is equipped with TX, RX and Power supply LED indicators. There are screw terminal block connectors on Power supply and MBus (5 pin) and RS232 (4 pin) side for connection.